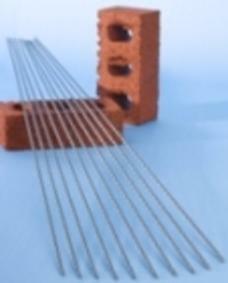 Patented helical re-bars for masonry repairs to walls and brickwork. These twisted crack stitching bars comprise 6mm high tensile (circa 8kN) stainless steel helical ties that are bonded across cracks in a wall to increase the tensile and flexural strength of masonry. The cracked wall is reconnected, tensile forces redistributed along the full length of the bars helix and the stabilised structure restored to full strength. To fix Thor Heliforce Bars you need: Thor W60 Flexi Grout, Helix mixing paddle, Finger trowel and Grout Master or Mortar Gun & nozzle.